PT Kimia Farma (Persero) Tbk - Kimia Farma is a leading state-owned company in Indonesia, running business in the field of integrated healthcare and pharmaceutical industry. Kimia Farma engaged in diverse business categories, such as pharmaceutical manufacturing, trade and distribution, pharmaceutical retail and international trade. PT Kimia Farma (Persero) Tbk is a public-listed company and registered its shares in Indonesia Stock Exchange (IDX) with stock code of “KAEF”. 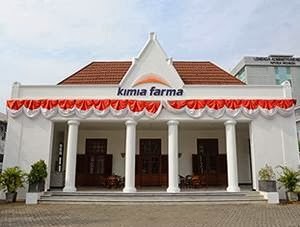 Kimia Farma’s shareholders are the Government of Indonesia, management/employee of Kimia Farma and public. The Government of Indonesia owns 90.025% of Kimia Farma’s issued share capital. The management/employee of Kimia Farma holds 0.152% of Kimia Farma’s issued share capital and public 0.152%. Kimia Farma is based in Jakarta now has 4 key subsidiary/affiliated companies, namely PT Kimia Farma Apotek, PT Kimia Farma Trading & Distribution, PT Sinkona Indonesia Lestari and PT Kimia Farma Diagnostik (subsidiary company of PT Kimia Farma Apotek). As of December 2015, Kimia Farma has 5 pharmaceutical plants, 47 trading distribution branches, 725 pharmacies, 43 laboratory clinics and 315 medical clinics throughout Indonesia. According to Kimia Farma Annual Report 2015 as quoted by JobsCDC.com, Kimia Farma has also shown encouraging achievements. Total sales in 2015 amounting to Rp 4,860.37 billion, or a growth of 7.51% of total sales in 2014 amounting to Rp 4,521.02 billion. Whilenet income in 2015 amounting to Rp 252.97 billion, or 6.95% higher than the previous year of Rp 236.53 billion. Minimum Diploma Degree (D3) from reputable university with major in Secretary. Minimum 1 year of experience as Secretary/Personal Assistant. Proficiency in English language and other languages is a plus. Attention to detail, high integrity and honest person. Willing to be placed in Central Jakarta. Able to join ASAP is preferred. JobsCDC.com now available on android device. Download now on Google Play here. Please be aware of recruitment fraud. The entire stage of this selection process is free of charge. PT Kimia Farma (Persero) Tbk - D3 Secretary to Director Kimia Farma July 2016 will never ask for fees or upfront payments for any purposes during the recruitment process such as transportation and accommodation.